Latest update to this guide: September 10, 2017: Added the new Afreeca ASL streams to the .bat file (preparing for ASL Season 4). August 19, 2017: Added MaNa, LancerX, Bonyth, and Schamtoo to the .bat launcher. September 5, 2017: Minor tweaks to the .bat launcher, added a few players. September 10, 2017: Added the new Afreeca ASL streams to the .bat file (preparing for ASL Season 4). Welcome back to Brood War. Unfortunately, Afreeca occasionally lags for foreigners (depending on the Afreeca server currently assigned to serve users), and the interface is confusing if you can't read Korean. 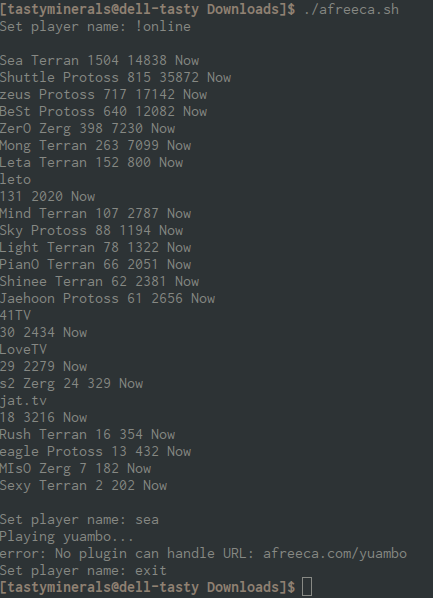 Players frequently use random IDs on Afreeca: Bisu is "rlaxordyd", Last is "rlatjdgus228", Shuttle is "jk890202". These are their stream names even when watching an embedded stream from TeamLiquid, so it quickly becomes confusing. The most lag-free method of watching streams is using Streamlink. It is a command line utility that connects live streams to a media player (usually VLC). This process is automated using a simple launcher (a Windows .bat file). This launcher features CDN server and stream quality options, and you can view multiple streams at once. You can watch Afreeca.com and Twitch.tv streams using this method, with more to come. Files and instructions below are always up to date. Any new .bat files, fixes or updates posted in the comment section are automatically added to this guide. If you are currently performing a first-time install, you do not need to look for file updates in the comment section. Updates posted in the comment section after your first time install may be of use to you, especially if the .bat file was updated to include additional players. Below guide confirmed working perfectly as of October, 2017. NOTE: As of writing, Amazon AWS is out of commission. Please use GSCDN for the time being. 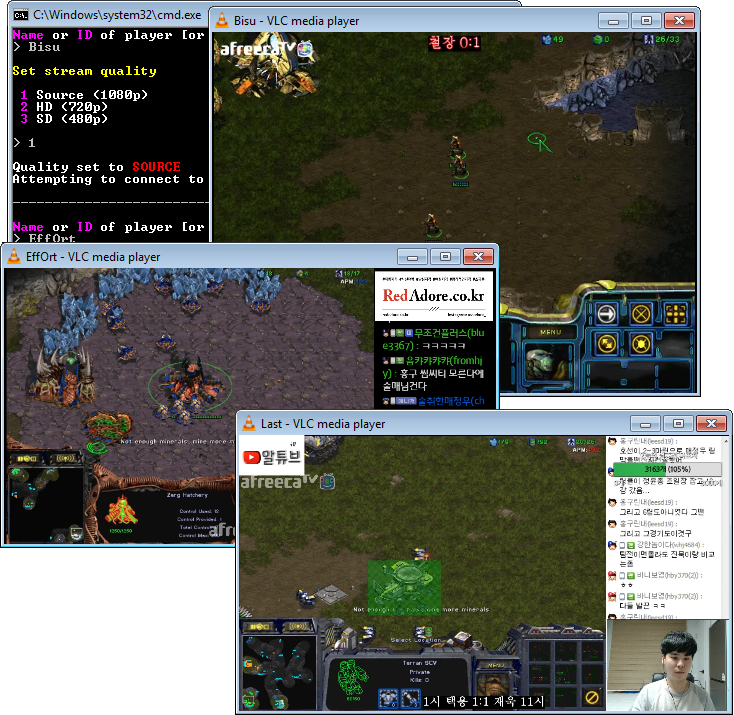 • Download Starcraft Stream Viewer.bat and run it. Done! This Linux install is maintained by TeamLiquid user letian. Contact him if you have any problems with the Linux setup. I have dropped my livestreamer fork and switched to streamlink backend. Now, to watch the bw streams via vlc you'll only need a bash script which you can take from here. As usual, you'll need to replace the afreeca.py (if you still haven't) which is installed with streamlink with the one here. The script can check who's online, set "aws_original", "aws_hd" or "aws_sd" quality of streams. Run multiple vlc stream instances (unless you explicitly forbid it in vlc config) with different players. Here is a github repo with the instructions and the required files. Ok, I figured it out for Linux. 1. First uninstall with your package manager any previous versions of livestreamer. 2. Do not add to /etc/hosts "121.156.109.165 chromecast.afreeca.gscdn.com"
3. Download my livestreamer fork with all afreeca modifications included. 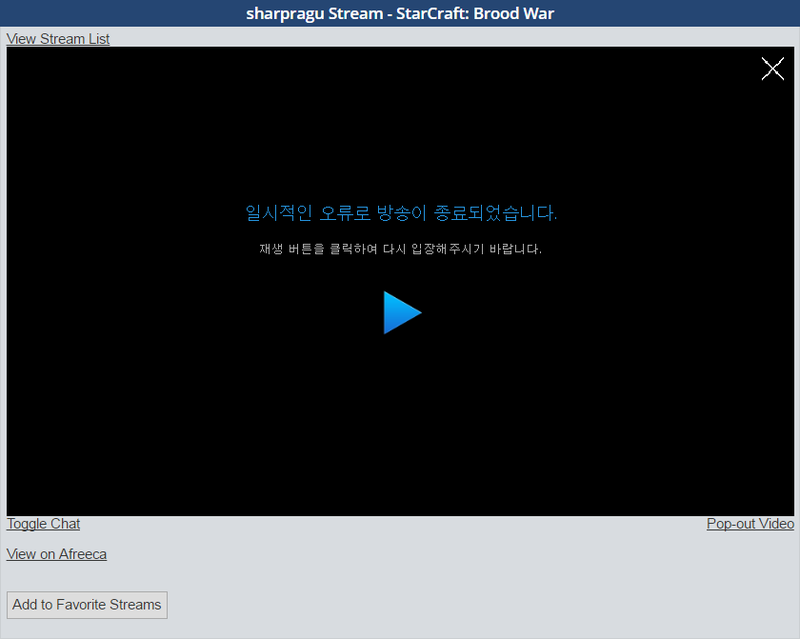 Now you can use afreeca.sh to play streams! Use !online command to get currently available streamers, use exit to quit afreeca.sh. Replace the afreeca.py file in this folder with the one you just downloaded (copy and overwrite). NOTE: Browser do not have permission to directly overwrite files in C:\Program Files or other system folders. You need to download the file to a location on your computer and then manually copy/paste and overwrite. If you installed VLC to a custom location you will need to edit the .bat file now. Click the spoiler below. If you installed VLC to a custom folder, you will have to edit the .bat file and add the path to the set vlcpath= line. Open the .bat file with a text editor (Notepad++ is recommended, although Notepad will do fine) and follow the instructions near the top of the file. Once you have installed everything, check the TeamLiquid sidebar to see who is currently streaming. (You can also check https://bwstreams.appspot.com/ which does the same thing and shows more streams.) Run the launcher. You will be given the choice between Afreeca CDN servers. Amazon AWS may be better if you are in the US, while GSCDN may be better for European viewers. If streams still lag for you, switch CDN servers first before you mess with quality options. The CDN option only affects Afreeca connections. When prompted, type in the name (or ID) of a player you want to watch, then select the desired stream quality. After a few moments, VLC should start up. You can keep typing in more names as well -- VLC will open new instances so that you can easily multistream. If you enter a name or channel ID that has not been added to the launcher, the script will ask you if you want to attempt to connect to that name on Twitch.tv or Afreeca.com. This way you can use the launcher to watch any stream on either platform so long as you know the channel ID. Lastly, most players have a lot of smurfs. Liquipedia has a list of SCR ladder aliases making it easier to look up who is playing who. If they are playing on the Fish server, the Fish Server entry on Liquipedia has a list as well. Q: Can I use another media player instead of VLC? 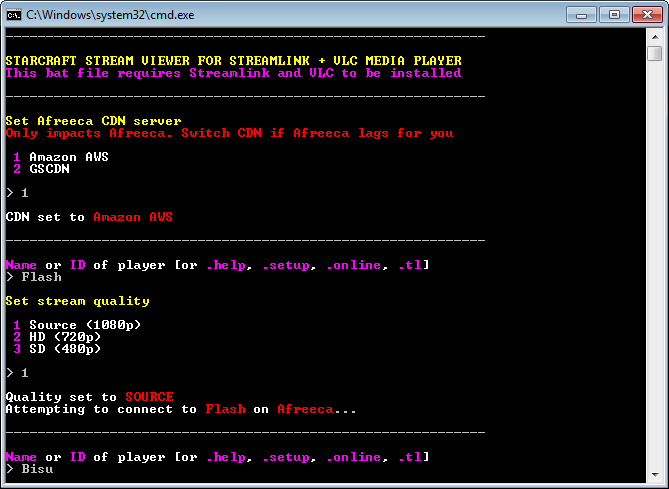 Streamlink does technically work with MPC, but you'll need to mess with the .bat file a bit. More on that in a bit. I haven't added native support for MPC because 1) extra work for me, and 2) some command lines are missing. Most notably --file-caching and --network-caching don't work, but you also can't add a meta title to an MPC window. When VLC pops up, it properly titles the window with the name you input, i.e. Bisu, Stork, Flash. MPC can't do that, so the window title remains something generic like "stdin". ...which by default is blank. Type in the path to your MPC player, i.e. ...which removes the "--file-caching=5000 --network-caching=5000 --meta-title=%name%" bit since MPC can't use those. This worked on my system just fine. Edit: If there is sufficient interest, I can make it so the .bat file accepts MPC by default as an option when you launch it. Let me know if this is something anyone else wants, otherwise I'm sticking with the basic VLC setup. Some streams might only get audio not video, to fix that, go to options > Internal filters > Splitters and then increase stream analysis duration, this will give it time to detect every stream it gets send! The second thing is that ofcourse have to go into multi window mode if you want to watch multiple streams, I know this is easy but I was confused for about 10 secs so I thought I'd let everyone know that that option exists! Q: It takes a long time between entering a name into the command line and VLC opening. A: That's normal. It usually takes 5 - 30 seconds for me to connect. Q: Can I watch Afreeca VODs using this setup? A: No, Streamlink cannot be used to watch VODs on Afreeca. Q: The downloads are broken, I can't grab the .py and .bat files! Q: I think the .bat file is broken, the colors are all messed up. A: If for some reason the .bat file appears messed up on your system (looking something like this as opposed to this), you may be on an outdated operating system. Streamlink requires Windows Vista SP2 or above (the guide has been tested and confirmed working on Windows 7, 8, and 10). Q: I have messed with CDN and quality options, but the stream is still lagging. Can I fix it? This IP address randomizes every once in a while as Afreeca hosts from different servers. If you experience stream lag, you may want to do a quick nslookup and add the new IP address to the hosts file. Right-click your hosts file, and uncheck read-only / write-protect. Edit the hosts file using notepad or notepad++. Q: I can't connect to some streams. When I try, I get this error message. 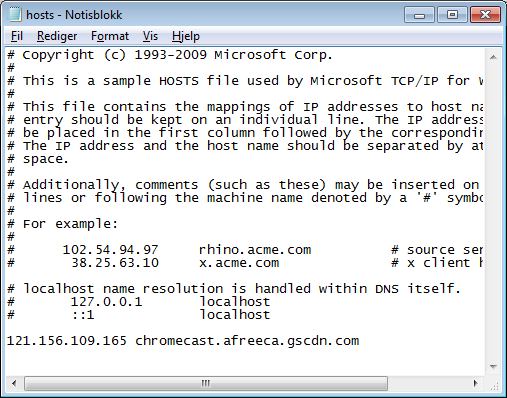 A: Remove any Afreeca IPs from the hosts file (see above). Q: I connected to a streamer, but it just showed a countdown timer that did nothing when it got to 0. A: Close the VLC window and type in the name again. This happens some times in embedded streams when watching Afreeca, possibly due to CDN or ad-service problems. Q: I'm getting a generic cannot find streamlink error. A: You haven't installed Streamlink properly. The .bat file requires you to install it using the Windows installer, which (among other things) adds Streamlink as a PATH variable so the .bat file can launch it properly. A: VLC is not installed, or VLC is not installed to the default directory, or you forgot to edit the .bat file to point Streamlink to the proper VLC directory. See the installation instructions again for details. A: You didn't properly copy and replace the afreeca.py file linked in the OP, meaning you either skipped this step or it failed to overwrite properly. Browsers do not have permission to overwrite files in C:\Program Files, so you have to do it manually. A: You probably didn't properly copy and replace the afreeca.py file linked in the OP, meaning you either skipped this step or it failed to overwrite properly. Browsers do not have permission to overwrite files in C:\Program Files, so you have to do it manually. A: Turn off your antivirus; it may be aggressively throttling your Streamlink connection. A: TeamLiquid only refreshes the sidebar periodically. The player may have just gone offline. Check https://bwstreams.appspot.com/ to see who is currently live and try another player. A: Some streamers (Horang2 does this some times) will occasionally set their streams to adults-only (19+) mode. When a stream is in adults-only mode, you have to use the Korean AfreecaTV Player (proprietary software) to view it, or Afreeca will refuse your connection. Either petition Horang2 to stop doing that, or find someone else to watch. Q: What happened to Livestreamer and the old guide on defiler.ru? A: Livestreamer is no longer being actively worked on, so any time the API changes or a plugin somehow breaks, there is no immediate fix. Afreeca keeps changing their API every few months to the frustration of everyone, and I finally got tired of updating the hls.py and afreecatv.py files. Streamlink is the current replacement for Livestreamer. It has additional quality options which are easy to find, options for CDN servers, and is generally updated very frequently. I have created a new .bat file to make use of these options. RoX.Malki still deserves credit for his original Livestreamer guide which formed the basis for this entire guide. His effort has given us months of watching Afreeca without lag. In that spirit, I'll try to keep things updated as best I can. I'm getting "Connection to chromecast.afreeca.gscdn.com timed out". upd: "It's not just you! http://chromecast.afreeca.gscdn.com looks down from here." It's up as of writing, and it should give you an IP address. After reading your message I tried connecting to Mong's stream using my setup and it worked just fine. I have seen this timeout error a couple of times, but it always cleared up within minutes. I imagine it's Afreeca messing up. The quality of Afreeca's servers to the outside world seem to depend on your location and luck. Keep "refreshing" as it were. If you added any Afreeca IPs to your hosts file, try removing them. i went online and saw the afreeca streamers and got icarus that was online and tried and it gave me this error. CfgosCuba: Are you on a 32-bit Windows system? You're using the afreeca_x64.bat file which is for 64-bit systems, and by default the .bat files expect VLC to be installed to default locations. The error message you are getting means Livestreamer can't find your VLC media player. Make sure you have VLC installed. If it is installed, edit the .bat file to point to the installation directory, or download the other .bat file and try that one. You're welcome. =) Good to know it's working. I am getting "No streams found on this URL." even though the player is shown online on "https://afreecabw.appspot.com/"
Can somebody try the same setup on linux? I have converted afreeca_x64.bat to afreeca.sh. It does not work on my machine for some reason, take a look at the . Couple months ago Afreeca changed their domain URL to afreecatv.com instead of afreeca.com, so "No streams found on this URL" was the result when you tried to watch streams with livestreamer. Changing the CHANNEL_INFO_URL to "afreecatv.com" fixed the issue. This can be found in the Afreecatv.py -file. Those "connection timed out" -errors occur to me from time to time, but usually fixes itself. At first I thought you used the outdated defiler.ru tutorial instead of mine. As I said in the OP, Afreeca changed their domain names around so the old scripts are broken. My updated afreecatv.py file fixes this problem. Download that and replace the afreecatv.py file you nabbed from defiler.ru, or edit it yourself. But apparently you're on Linux, so anything goes. To everyone: Please read the Troubleshooting & FAQ section in the OP if you have any problems! This problem is mentioned in the FAQ. Did you remove any and all Afreeca IPs from your hosts file? I was getting this very issue when watching streams, and it turns out an old entry in my hosts file was the culprit. Remove that -- if the problem persists we can try something else. Basically all I added is afreeca.sh with ability to scan for online streamers and a livestreamer fork with your modifications included. Run afreeca.sh as "./afreeca.sh". You will be prompted to set the player's name. You can type "!online" to retrieve a list of online users. Type "exit" to quit the program. This is a really nice guide for ppl who have constant lag problems with afreeca. Now, vlc works flawlessly and Flash stream does not lag anymore. It was literally unwatchable previously. Big thanks! I get a generic windows "cannot find livestreamer" error. Everything was installed in Default locations too so I'm not sure what the issue is. Can you elaborate more what you've done and how you are trying to use the program? Should be easy issue to solve. Also, i presume you installed it from here?